We hold an annual Family-to-Family Health Information Center's Partners in Care Summit. Develop strategies to strengthen partnerships between families and professionals, ultimately leading to improved outcomes for CYSHCN. Visit our Video Training Library to view sessions from past Partners in Care Summits. This series of trainings was funded by a grant from the Alabama Council for Developmental Disabilities (ACDD). 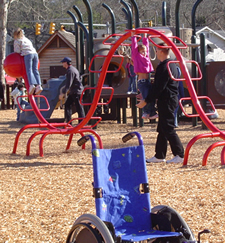 The primary grantee was Alabama Disabilities Advocacy Program (ADAP). ADAP worked in collaboration with Family Voices of Alabama and Childrens Rehabilitation Service (CRS). Materials used during these trainings are archived on the ADAP "Transitioning to Adulthood: 'What's Next?' " website. The first two installments in this new series provide guidelines on: How to Choose a Social-Emotional Curriculum and When to Seek Outside Help for Children's Problem Behavior. Two CSEFEL videos, Promoting Social Emotional Competence and Practical Strategies for Teaching Social Emotional Skills, can now be viewed online in their entirety. AL PTI NCD provides free information and training to families to assist them in becoming advocates for their children with disabilities. Training is focused on assisting families to effectively access community support and other available resources, understanding special education law, increasing knowledge of and accessing alternative dispute resolution, and increase knowledge of other disability issues. The AL PTI NCD project is sponsored by the Alabama Parent Education Center (alabamaparentcenter.com) and provides information and services to Alabama families with children ages birth to twenty-six with disabilities. The program is designed to empower and enable them to work collaboratively with schools and agencies to improve services for their children.